I haven’t listened to audiobooks in years. I live to close to work, so it’s not worth queuing one up for the short commute. However, we’ve recently been struggling with a toddler who can climb out of her crib, and who will the moment she’s laid in it. As we’ve been working through these nightly issues, it has meant a lot of time in a darkened room. I decided to borrow an audiobook from the library, and this was one of the few available in the romance genre. 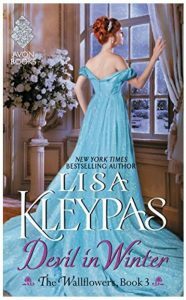 I’d picked up two other of Lisa Klepas books in the past, and I didn’t get far in either of them as I didn’t much like the characters. I hated the heroine in one and the hero in the other. But a bad book was better than no book, so I borrowed it without much hope. The narration was quite good. It took me almost twice as long to listen to the book as to read it, but as speed wasn’t a concern, I was okay with it. A wealthy heiress is desperate to escape her horrible relatives. They beat her, starve her, and otherwise abuse her. She has no recourse as she’s a woman and cannot control her fortune herself. As they plan to force her to marry her abominable and disgusting cousin, she takes action. I overlooked the absolute heartless family. It’s such a trope in books, that you find it even in modern classics like Harry Potter. The heroine (Evie) steals out of her house and manages to get to the house of one of the most notorious rakes in London. And, one who is about to have his debts called in. So desperate to find an heiress to marry, he had actually tried to kidnap his best friend’s fiancee. (I assume this is all in another book). Evie proposes to him. Sebastian St. Augustine marries her, gets her fortune so he gets out of debt, and she gets her freedom. She knows he doesn’t love her, or care about her, so she will be able to come and go as she likes. He agrees, and the rest of the story revolves around them going from a marriage of convenience to one of love, and all of the changes that both of them undergo for that to happen. There are lots of characters who make an appearance that I believe are from previous books. If I’d read those books, it probably would’ve meant more to me. I didn’t, and it didn’t detract from the story. Overall, I was pleased with the characterization. Both Evie and Sebastian had upbringings that shaped them. The reconciliation between the two as they fell in love was real. The emotional distance real. This wasn’t something a 5 minute conversation was going to fix. Evie needed to come to terms with how her own family had treated her and her ability to care for another. Especially a man with such a jaded past. Sebastian had to come to terms with the abandonment he’d felt as child, and how he’d responded to it. These were quite good. If I had the book in kindle form, I would go back and reread them. Study them for ways to make my own writing better. I may yet open up the two books from this author I have and find the steamy bits. All in, I am glad they had the book at the library and that I gave the author a second try. I may even go back and take a look at the two books of hers I have. A salutary reminder that all writers have to start out somewhere & true writers are always seeking to better their writing ability! Good thing you’ve given this one another chance, especially as there’s even the potential for you to learn something from her this time! Honestly, I do too. In this case, hers was the only audio book the library had for me to borrow.